I thought as I got older and our kids grew up life would get a little slower, but I was so wrong. We are at the phase in our life that we have a grandchild now. This past weekend on Sunday we had a baptism of that first grandchild in the morning and then a celebration of our daughter Krista’s birthday in the afternoon. You may know that when we celebrate a birthday in our house the birthday person gets to choose the menu. I am willing to cook just about anything that they ask for. My daughter Krista is one of those people that like to challenge me; her request for her birthday meal is usually something that I have never made before. Which I have to say I enjoy that and it makes me step out of my comfort zone of cooking. This year she is living in Chicago and she was at home for the baptism and her birthday. So I have been on the phone with her to see what foods she would like to have on her birthday menu. This year she wanted chicken lasagna and she requested a white sauce instead of the everyday red sauce. For the rest of her menu she wasn’t quite sure, so I made her some things that I thought she would enjoy and that would go well with the lasagna. I will be posting the rest of the menu later this week, so if you would like to see what was on the menu I hope that you will return when the rest of the food is posted. I wasn’t quite sure what would go into a white sauce since this is something I have not made before; my lasagna always has a nice red sauce. Looking on line a lot of the white sauces that I found consisted of condensed soups and I didn’t want to go that route. I did finally find a white sauce chicken lasagna recipe on allrecipes.com. The white sauce is loaded with flavor; there is onion, garlic, mozzarella cheese, Parmesan cheese, and other tasty things that I will list later in the recipe. I have to say that I did make a pizza also, because I knew a few of the family members would be not so thrilled with this type of lasagna. But overall everyone enjoyed, for myself I liked it better than the traditional lasagna that I usually make. I liked so much that I maybe using this white sauce on one of the next pizza I make, I may have to tweak it a little but I think it would make a tasty pizza too. 1 Preheat oven to 350 degrees F. Bring a large pot of lightly salted water to a boil. Cook (about 9 to 11) lasagna noodles in the boiling water for about 8 to 10 minutes or until tender. Drain and rinse with cold water. 2. Melt the butter in a large skillet over medium heat. Cook the onion and garlic in the butter until tender, stirring frequently. Stir in the flour and salt, and simmer until bubbly. Mix in the broth and milk, and boil stirring constantly, for a minute. Stir in 2 cups mozzarella cheese 1/4 cup Parmesan cheese. Season with the basil, oregano, and ground pepper. Remove from heat and set aside. 3. Add the first layers of noodles, enough to cover the bottom of a 9 x 13 inch baking dish. 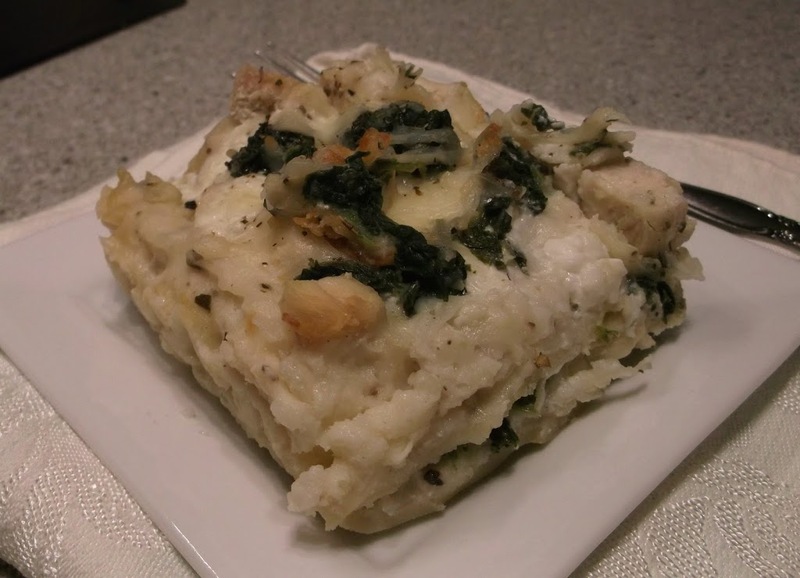 Layer with half of the sauce mixture, cottage cheese, mozzarella, and spinach. 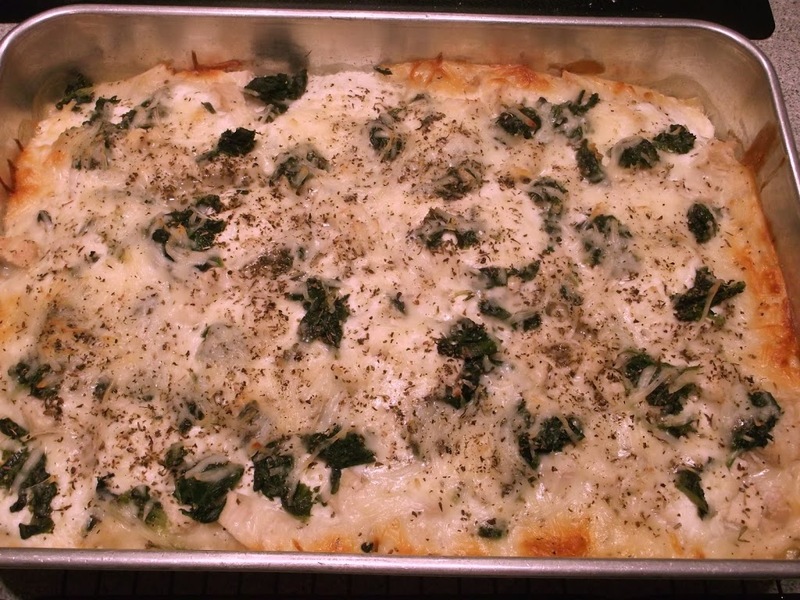 Top with the remaining noodles, then add the remaining sauce, cottage cheese, mozzarella and spinach. Sprinkle with the Italian seasoning. 4. Bake 40 to 45 minutes in the preheated oven or until the cheese is starting to brown. I love that your daughter challenges you to make new things. The lasagna looks great & I am looking forward to seeing what else you made for her birthday dinner. 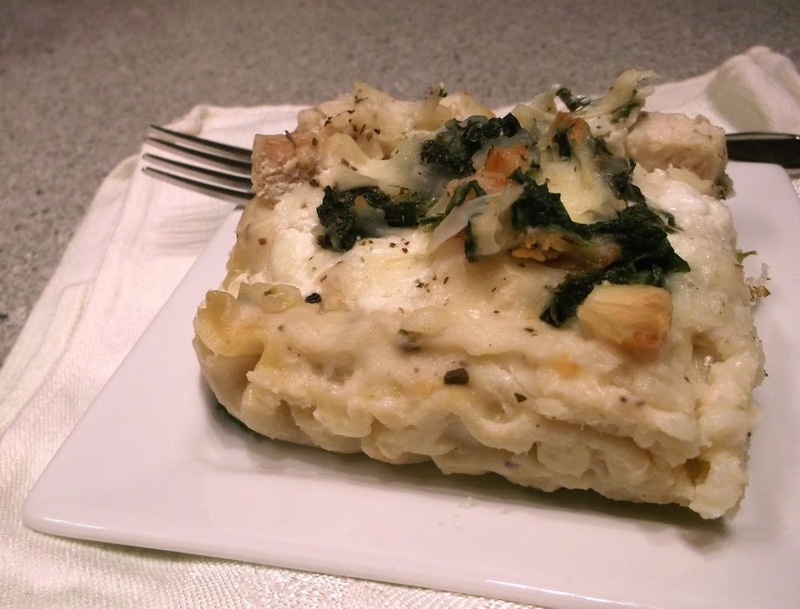 Looks delicious your chicken lasagna…especially with the white sauce…yum! Oh, boy, does this look amazing!!! I hope to try it soon!! !